There are fantastic pools all over the world. Then there are some which take the meaning of the word pool to a whole new level. They’re visually stunning and often in idyllic locations. Yes, they’re the pools you’ve probably scrolled through photos of a hundred times on Instagram and dreamt of swimming in. So what are you waiting for? 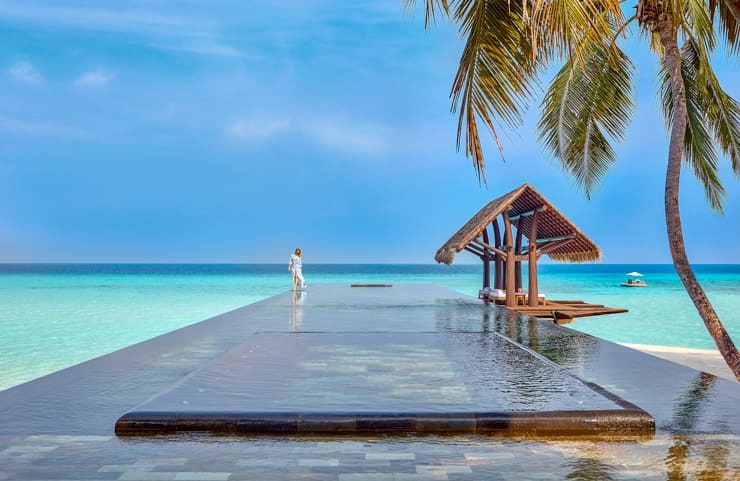 To get to swim in any one of those pools, you may need to suffer the hardship of immersing yourself in some indulgent luxury at an elite resort. Doesn’t sound too bad, does it? But believe it, choosing which one of these ten of the most marvelous pools in the world to dive into is not going to be easy. They are all totally incredible. The Serenity pool at the One & Only Reethi Rah resort in the Maldives is an architectural marvel. It juts out into the ocean and appears to reach the distant horizon in a seemingly endless stretch of blue. Its minimalist design is super sleek and sophisticated. Lay in the shallows on the stone bed or slip into the pool’s jacuzzi after swimming a few lengths and you’ll feel as if you’ve stepped into a Zen garden with water as its main feature. This one-hundred-foot-long lap pool is reserved for adults only so there are no noisy youngsters to disturb the tranquillity. Why Go? 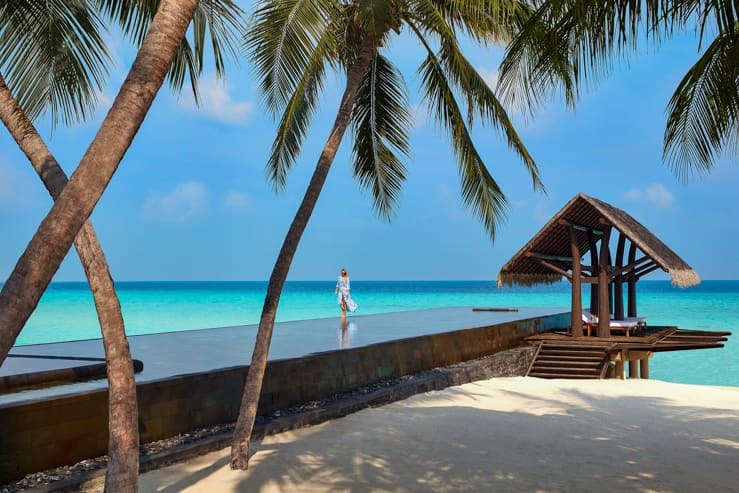 The One & Only Reethi Rah Serenity pool has to be one of the most relaxing places in the world to take a swim. Submerge in the waters of your own private paradise surrounded by palm trees and white sand. It’s a total chill out. The Joule Hotel in Dallas has a rooftop pool which is unique and is the one everyone wants to swim in. You need to book yourself a room at the 1927 constructed hotel before you can get the chance though as it’s reserved for guests only. The hotel building has an interesting history, it was originally the Dallas National Bank, and is full of museum-worthy artwork, but the pool is ultra modern. This pool itself is a structural miracle in the way it extends out from the tenth floor. The eight-foot-long projection which reaches out over Main Street, Dallas, has a glass wall at the end and the spine-tingling views down to the street below are enough to bring on an attack of acrophobia. Why Go? If you’ve swum in the pool at the Joule Hotel, then you can truly boast you’ve swum in the most famous pool in the world. When you do, don’t forget to take a waterproof camera with you and make sure you take a photo or two to post on Instagram to prove it. If the thought of swimming in a pool in the snow-covered Swiss Alps makes you shiver, think again. There’s an infinity pool at the Cambrian Hotel, which once you’re in it you won’t want to get out again even if it’s snowing. The Cambrian Hotel pool stretches out from the main hotel building into the grounds, and the views of the mountains all around it are just breathtaking. Though the vistas might look like something off a Christmas card, you won’t get goosebumps. The pool is heated to a moderately warm 32°C which is perfect for soothing any aches and pains you might have if you’ve been skiing on the slopes or hiking. You don’t need to brave the cold when you get out either. The pool interconnects with the hotel’s indoor pool, and you can swim straight from one to the other through a special door. Why Go? The Cambrian Hotel pool is in one of the most picturesque settings you will find anywhere in the world. Plus, you’ll find the amazing contrast between snowy landscapes and swimming in the warm pool water is one of life’s unforgettable experiences. The pool at the Sarojin resort in Khao Lak, Thailand, is an oasis of turquoise water surrounded by tropical jungle. When the sun’s rays hit the pool, the water takes on the hue of the tiles its been lined with. It’s a color which blends well with the environment to create a superbly relaxing atmosphere. This eighty-foot by eighty-foot leisure lagoon has three floating pavilions for lounging in and a jacuzzi on one side if you’re in need of some invigorating water therapy. Sounds idyllic, doesn’t it? It gets even better after dusk when the pool is illuminated with spotlights. Just stunning. Why Go? If you ever wanted to hide away from the world in the style of the rich and famous, then this is the place to do it. This pool in its tranquil tropical setting will not only make you feel like a millionaire; it’ll make you feel like a star as you’ll be swimming in one of the world’s most beautiful, film-worthy, pool locations ever. There are pools with views, and then there are pools with views which will leave you utterly speechless. 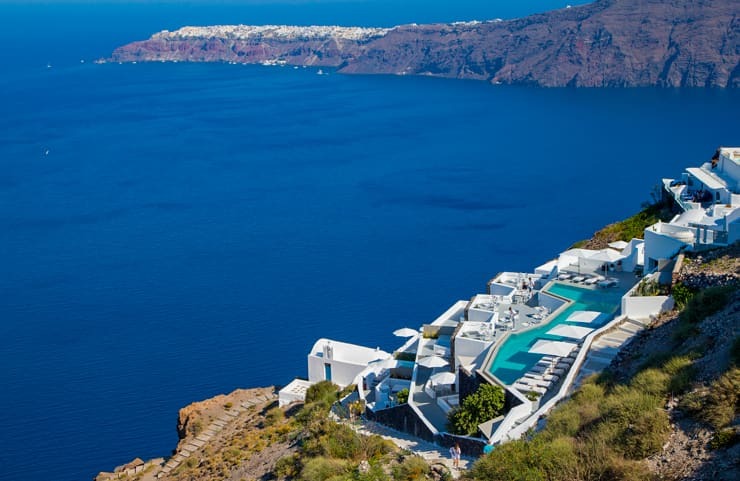 The huge infinity pool at the Grace Hotel on the Greek island of Santorini is one of the latter. The hotel is situated on a clifftop and the azure waters of the pool fuse into one with the brilliant blue of the Aegean Sea. While a daytime swim in this pool is impressive, and the views along the coastline and across to Skaros Rock leave absolutely nothing to be desired, it’s as night falls it really comes into a whole new league of its own. Take an early evening dip in this pool, and you’ll be watching the sunset on the horizon in a blaze of fiery colors. It is truly incomparable. Why Go? You really won’t find anywhere more awe-inspiring to a watch a Greek sunset from than in this pool. The spectacular doesn’t end there though. Once it’s dark, the pool is lit with underwater lighting which is simply striking. Some things are just not made for sharing, and that includes infinity pools. If you want one all to yourself then you need to go to Jade Mountain in St Lucia. Here you can choose from twenty-four sanctuary-style accommodations which each have their own infinity pool. The pools are super sumptuous and merge visually into one with the Caribbean Sea. The bigger the sanctuary, the bigger the pool. Can you imagine waking up and strolling out onto your balcony then stepping into your own pool. With no-one else there to interrupt your privacy. 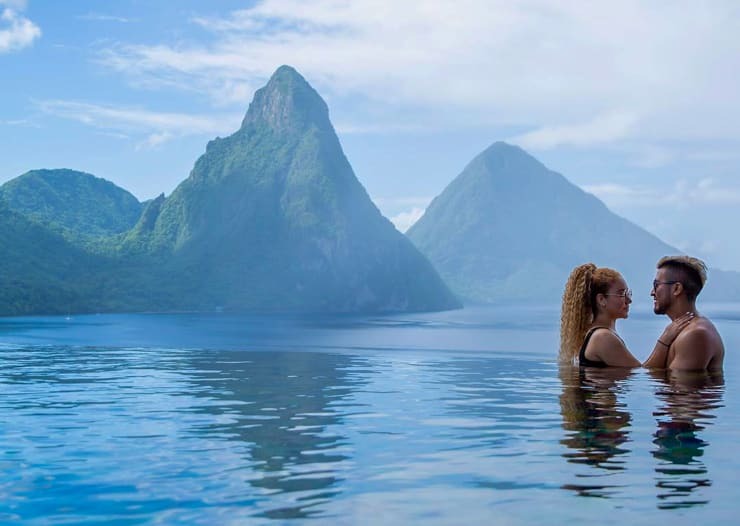 You can swim or just float and take in the scenic views of the Piton Mountains. Why Go? Sometimes you just don’t want other people around. Maybe you want some intimate time with your partner, and this is the ideal place for couples. Spend time together here, and you’ll really be getting away from it all. It’s pure pool perfection. 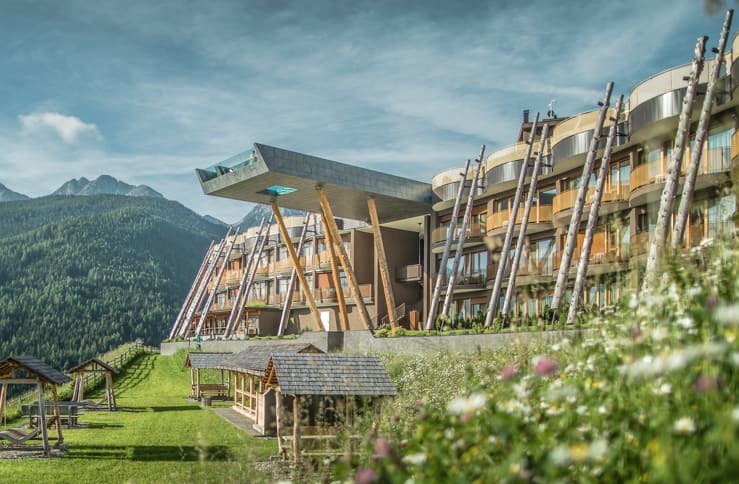 The Sky pool at the Alpin Panorama Hotel Hubertus is an infinity pool with a difference. While most pools are designed to create the optical illusion of joining with the sea, this one doesn’t. It fuses, as the name suggests, with the sky. The Sky pool is a mammoth, eighty-two foot long construction suspended on stilts forty feet above the ground. The end wall and a panel in the base are glass so when you swim you have the sensation you’re almost flying. Why Go? 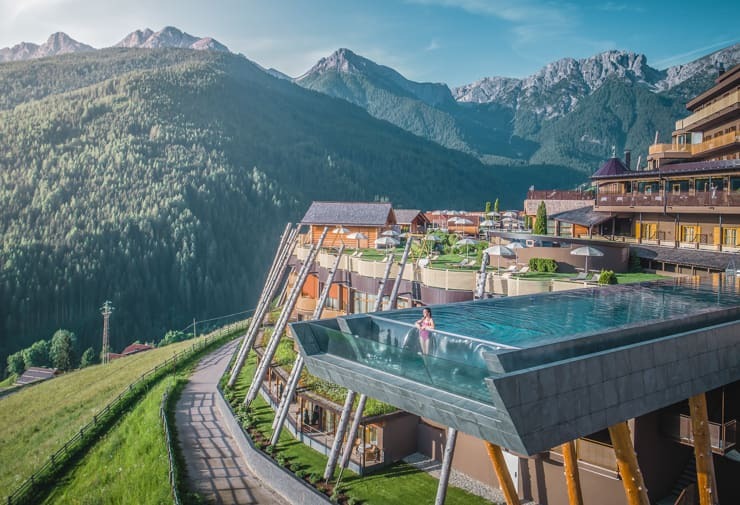 Whether you’ve been hiking the Dolomites in the summer or skiing there in winter, a swim in this pool will make your stay in the South Tyrol just that bit more special. The views of the pine-clad mountains are even more impressive when seen from in the water. There’s only one thing better than an infinity pool, and that’s two infinity pools together. The split-level, freshwater pool at the Ubud Hanging Gardens is an infinity pool to dream about. Swimming in the top pool, you’ll be on eye-level with the tree canopies of the surrounding jungle and be able to look down into the pool below. In the lower pool, you can walk down the stone steps into the crystalline depths, lay on the central island or just chill in one of the semi-submerged seats while listening to the water cascading from above. Why Go? If you’ve got a bucket list of places you want your photograph taken, the Ubud Hanging Gardens pool just has to be on it. Once you’ve snapped a shot of yourself here, you can honestly say, you’ve had your picture taken in one of the most photographed pools in the world. You may need to wait your turn to get that amazing shot, but it’ll be worth it when you post it on Instagram and get all those envious reactions. When is a pool not a pool? When it’s as big as the San Alfonso del Mar in Algarrobo. 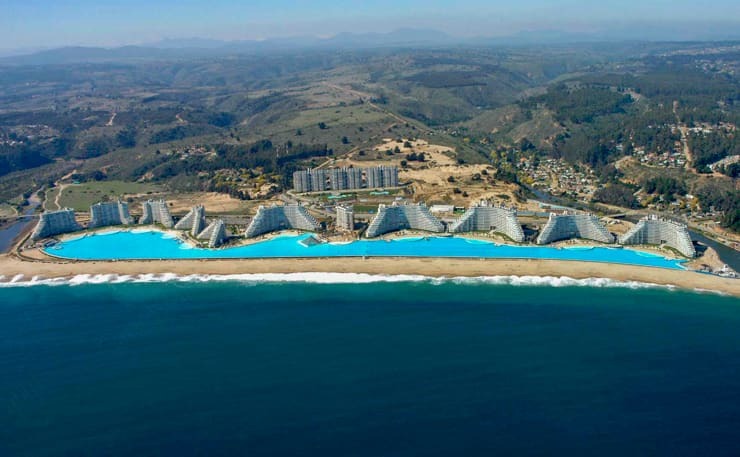 This mega pool measures a staggering three thousand three hundred feet long and covers a surface area of almost twenty acres. Stand on the edge of this pool, and you’ll get the illusion you’re just about to step into the ocean. The San Alfonso del Mar was once the biggest pool in the world but has now been relegated to second place in the rankings by the City Stars Sharm El Sheikh. That fact doesn’t make it any less impressive. The waters a comfortable 26°C all year round and easily rivals the South Pacific Ocean with its tropical blue colored waters. Why Go? If you love watersports, then this is the pool for you. It’s hard to believe that so many different activities actually take place in a swimming pool, but they do, and it’s still completely uncrowded. At the San Alfonso del Mar, you can snorkel, scuba dive, sail a boat or go kayaking. How many pools can you do that in? 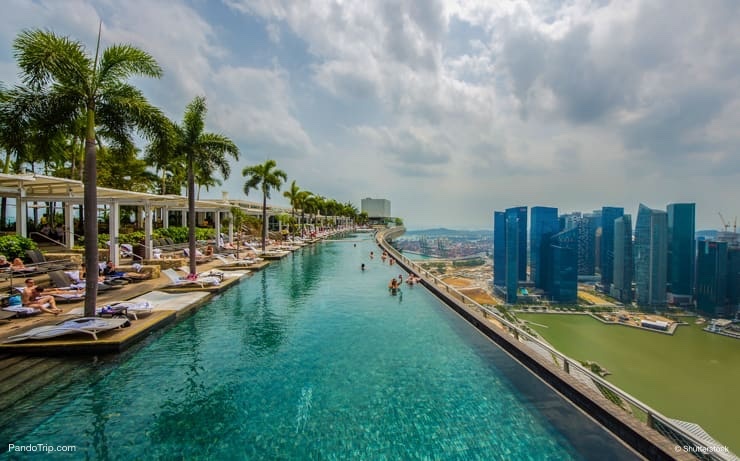 The rooftop infinity pool at the Marina Bay Sands Hotel in Singapore as well as being one of the marvelous pools in the world is one of the most elite. The pool, which looks almost like an artificial river backed by tropical palm trees, reaches right to the edge of the building. Look down if you dare as it’s fifty-seven stories up from ground level. 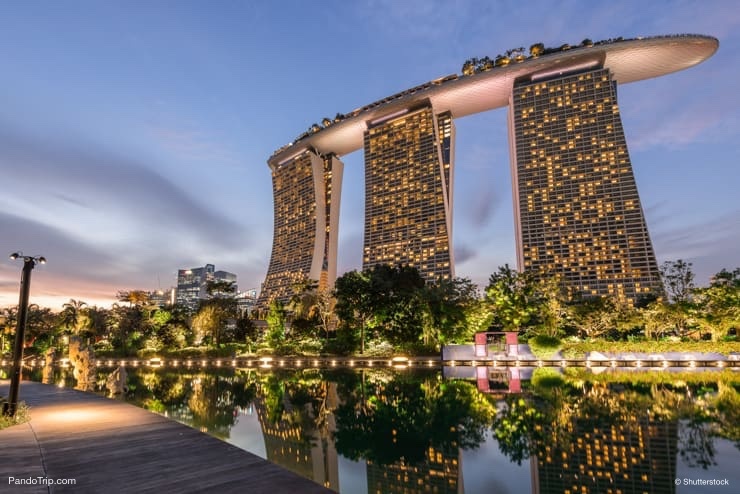 You need to be a guest at the Marina Bay Sands before you can swim here. The pool area can only be accessed if you have a room key card. That doesn’t mean it’s not a busy pool though. To avoid the masses, you need to go in the early morning. 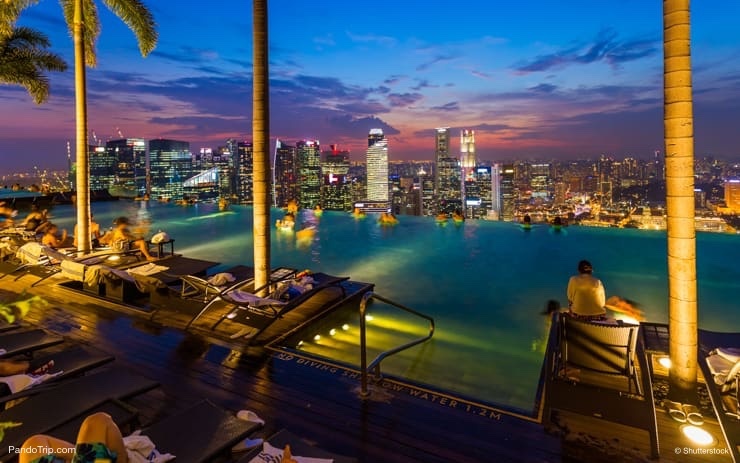 Day or night, the pool is open until eleven in the evening, one of the things that makes this pool so special is the incredible views over the city. Why Go? If you’re going to take a selfie in Singapore, then this is the place to do it. As well as being seriously Instagram-able, you’ll have taken your selfie in the biggest rooftop infinity pool in the world. Enjoy your swim!